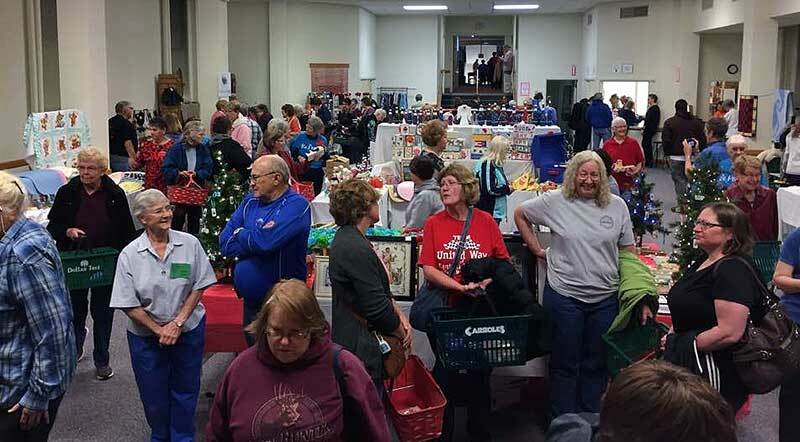 Shoppers from Great Bend and around the country support the Great Bend Mission Bazaar. Great Bend, KS – The sun was not even up on November 11 in Great Bend, KS, but the line in front of the of Dominican Sisters of Peace Motherhouse could have stretched nearly a city block. Women with shopping bags, families with small children, travelers from as far away as Louisiana – all waiting to shop for the handcrafted gifts, embroidered tea towels, baked goods, jellies and more offered that day. Inside, an army of volunteers – Sisters, Associates, friends of the Congregation – joined in prayer to thank God for the work that had been done so far, and to pray for a successful day ahead. And at exactly 7 am, the Dominican Sisters of Peace Mission Bazaar opened its doors. Sr. Corona Bayer, OP, is one of many Dominican Sisters of Peace who create hand-crafted items to be sold at the annual Mission Bazaar. The Bazaar serves as the major fundraising effort for three missions of the Sisters: support of our Nigerian Sisters, the Dominican Sisters of St. Catherine of Siena, the poor of Kansas and Colorado, and for the Congregation. Planning, organizing and stocking the annual bazaar require a Congregation of volunteers. From sisters, friends and associates who create the crafts, food products and other items to be sold, to the volunteers who prepare mountains of cinnamon rolls and oceans of coffee for Bazaar-goers, to volunteers to set up booths, stock shelves and help clean up after the day is done, the annual Mission Bazaar is truly a labor of love. Others support the bazaar with their loyalty and their purchases. 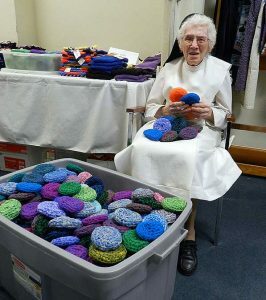 Sr. Elaine Osborne, OP, of the Great Bend Motherhouse, remembers two ladies who attended the bazaar for years, then moved away with their husbands. They returned a few years later, explaining that their husbands come back to Kansas every year for pheasant hunting season. Now they return with them to make the Great Bend Bazaar a stop on the trip. Families are a big part of the Bazaar too. From the time the doors open until the Raffle Winners are announced in the afternoon, moms, dads, kids and extended families enjoy the food, crafts, booths and more. 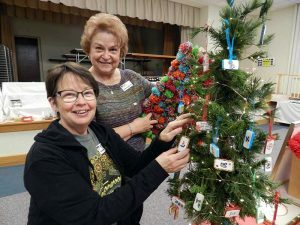 Dominican Sisters of Peace Associates Bobbi Cline, (left) of Richardson, TX, and Geneva Brungardt, (right) of Storm Lake, IA, traveled to Great Bend, KS, to volunteer at the Great Bend Mission Bazaar. Thanks to the efforts of the many volunteers and the generosity of both the Great Bend community and the many Catholics across the United States that purchased tickets for the Bazaar’s raffles, the Great Bend Mission Bazaar realized a 10% increase in proceeds this year. All funds raised will support the St. Catherine Sisters in Nigeria, missions that assist the economic poor in Kansas and Colorado, and the Dominican Sisters of Peace Benincasa Fund, which offers emergency assistance to people across the country.